Yesterday turned into an adventure. 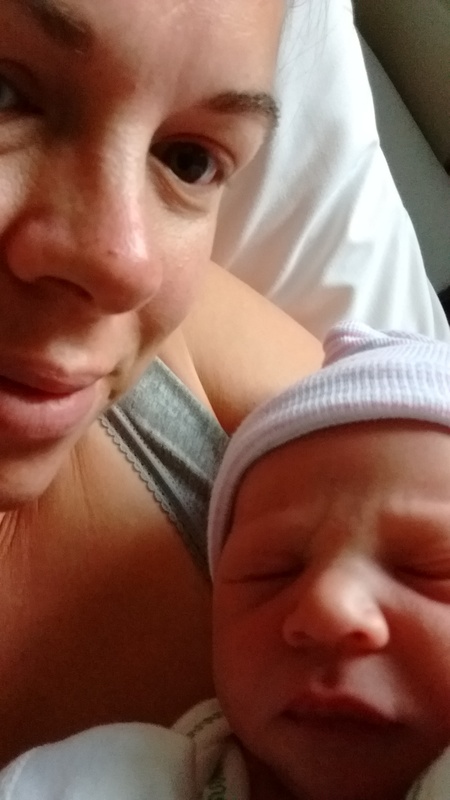 I had an appointment with the midwives at 9am, and had been contracting since 1:30am – albeit not very intense or very close together. At that appointment I was 3cm dilated and still 50% effaced. Grant was a -2, meaning, he wasn’t fully engaged yet – not super unusual for a second pregnancy. As the day progressed, the contractions slowly got closer together, and slowly gained in intensity. I got really tired – partly from not sleeping well due to contractions, partly from contracting. I watched 30 Rock while moving around my room – from the yoga orb, to pacing, to lying down. Bob came home around 4:30, and made us some food. Between 4 and 5pm, my contractions got closer together and also got more intense. I had to start being vocal during these contractions, even though it didn’t particularly help. After we ate, I took a warm bath, which felt great. At the end of the bath, I started having contractions even closer together and they were lasting about 2 min each. Which is a long time to have a contraction for! Imagine the worst stomach cramps ever. Now imagine you’re cramping around a baby. It’s really dreadful. Bob called the midwives and she said to go right to the hospital. I wasn’t getting a break anymore between contractions, so I yelled for the entire 20 minute ride to the hospital. Bob was patient and encouraging, even when I told him not to touch me or squeeze my hand back (I was squeezing his hand while he was trying to drive). At the ER, Bob ran inside to find out what to do next while I got out of the car howling. A very concerned man came over and asked if I was there alone and needed help. Two more guys (none of these were hospital employees, they were just waiting in the ER) came out too and got me into a wheel chair and wheeled me in to Bob. I just howled and howled. I could feel that it was time to push, but I also did not want to have the baby in the ER waiting room. A nurse wheeled me througj the hospital and took me up to labor and delivery while I screamed at everything. An L&D nurse took me over while the midwife was fetched, and I tried to break her fingers. The midwife asked if I wanted to labor on my hands and knees on the bed, and since I was already doing that, I said yes (at high volume). She told me to start bearing down into each contraction. Bob let me squeeze his hand, and watched me to tell me when to breathe. I told everyone who would listen that I could not deliver the baby. It was just too hard. Not only was it the worst pain, it was far too much pressure, and I couldn’t feel that he was moving at all. Until he was in the birth canal, then I could tell he had moved lower. And that was a new pain, which was almost a relief after the deep cramping. I once again confirmed that this was not working and I could not do this. Oh the laughter. I moved onto my side, and finally felt him begin to crown. I had always thought that crowning would be the worst of the pain (with the twins I had an epidural, so I didn’t feel the crowning), but it wasn’t. I didn’t tear or need an episiotomy (where they cut your vaginal opening just a little to make more room), so that probably contributed to it not hurting that much. When Grant came out, he was still in his bag of water, although the bag itself was mostly depleted. The bag had sprung a leak, but he emerged encased. This is called being born in caul, and it doesn’t happen very often. If you’ve watched birth videos (which, maybe don’t) it looks like the hard part is getting the head out, and then the rest of the body sort of slithers out. That is true. Once his head was out, I breathed in and out twice and one more push and his body was out. Instant relief. This whole process felt like it took several hours, but it was only 21 minutes from the time we got to the hospital until he was born. The midwife put Grant on my stomach right away, and after a few minutes, Bob cut the cord. And a few minutes after that, I delivered the placenta. I was able to hold Grant for quite awhile in the l&d room, and also was ready to pee right away. I got a shot of pitocen in my thigh, to help my uterus contract. After birth you continue to bleed for awhile, because blood vessels connect to the uterus to feed the placenta with blood, and your blood level increases by about 50% during pregnancy. With both pregnancies, I’ve had very little bleeding (comparatively), and relatively quick recoveries. Also during this initial recovery period we got me admitted to the hospital, since there had been no time before birth. After that, we came to our new room in postnatal and we will be here until Saturday morning. The kids will get to come visit their brother today, and I’m very excited to see how that goes! Grant has been sleeping very well, and has already been nursing well. So well, he has a full tummy and just wants to nap all morning. After his first bath this morning, he’ll have another feed and nap. Last week at the pool, another mom said that friends of hers who had twins then a singleton described having a singleton as getting a cat, compared to the insanity of twins. So far, that feels accurate. Welcome, Grant! And congratulations to mama and dad! What a wonderful birth story. With my second I told everyone in the room “I don’t want to do this, I can’t do this.” I remembered what it felt like the first time (no drugs) and I wasn’t the least bit interested in doing it again. They all gave me a withering, “it’s a bit late to decide that now…” look. My husband told me today he managed to refrain from saying “you don’t have a choice, though” – fortunately for him. Congratulations! When our daughter was born in the bag the nurse said she was ‘born with her shirt on’. I was reading up on it and saw that was a way to refer to it! It’s cute. You’ll probably hate me for this. My daughter was a one push delivery and only a very short time in labor. She made up for, though in late years being the teenager from hell. I lost every lb I gained before I left the hospital, zipped up my jeans and got in the car.